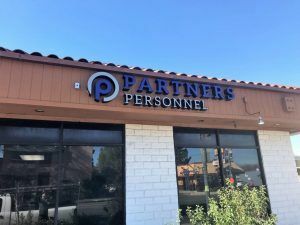 Partners Personnel was opening a new location in North Hollywood, California and needed a building sign with their logo to advertise their new location. They wanted the sign to be able to light up at night time so we made them a channel letter sign. Channel letters have a translucent face and there are LEDs inside of them so the signs can light up at night time. As you can see from the photo, this very dimensional sign stands out very well against their fascia. Partner Personnel provides automotive, industrial, professional, skilled, and technical staffing and recruitment services, while offering temporary, contract, and permanent employment opportunities to job seekers. Partners Personnel is growing rapidly and now have many offices throughout California along with a few offices spread out in Illinois, North Carolina, and Texas. There is actually another new location close to us that we did the signage for. Be sure to check-in to learn more about our other sign for Partners Personnel. Looking for a new employee while running a business or taking care of your daily responsibilities can be hard to balance. By hiring a staffing agency, you don’t have to take additional time out of your day creating job posts or sifting through numerous resumes. We help businesses like staffing agencies advertise their location to new customers while helping existing employees or clients find where they need to go. Channel letters are a great choice for signs like these because they are very visible both in the daytime and at nighttime. If you have multiple locations for your business and are opening a new one, call us for your new building sign. Your logo and branding are very important and we can make sure that your company is represented properly whether you want a channel letter sign or a dimensional letter sign.